Activities: Delta Sigma Pi Professional Business Fraternity, Accounting Students Association, National Residence Hall Honorary, Housing Chair for the National Association of College and University Residence Halls (NACURH) 2016 Conference. Career goals: It would be my dream to work in New York City for one of the larger accounting firms. The feedback of extended family and friends who also majored in accounting and finance or were familiar with those fields definitely helped. Now being in the business school here at UD reassures me every day that I have made the right decision. 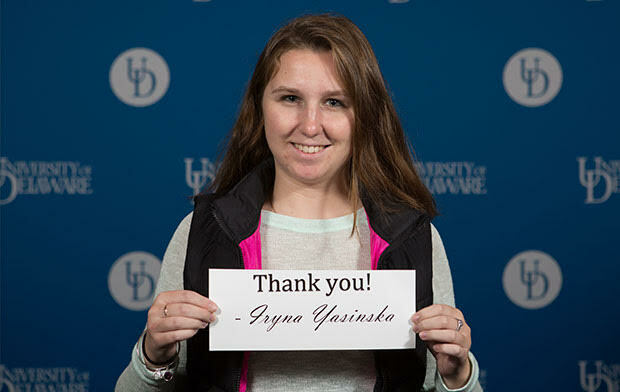 How has receiving the Micklin Family Scholarship made a difference in your UD career? Receiving the Micklin Family Scholarship made a difference in my UD career because it proved that hard work doesn’t go unnoticed. It gave me motivation to keep going and push myself even further. Why is receiving scholarship assistance important to you? Receiving scholarship assistance is important to me because even though I am extremely lucky to have my mom financially help me through college, I know how hard she has to work to pay for just one semester. So every little bit definitely helps. Thank you so much for your support. It is truly an honor to be the recipient of this scholarship.